In late October, DVRPC awarded $5.2 million through Phase I of its Regional Trails Program, a grant program funded by $10 Million from the William Penn Foundation, to eighteen projects around the 9 county Delaware Valley region. These initiatives include both trail design and trail construction in New Jersey and Pennsylvania. They extend existing trails, including the Schuylkill River Trail in Phoenixville, the Chester Valley Trail near Exton, and the East Coast Greenway in Tullytown. 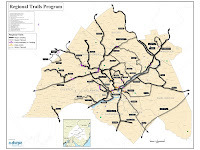 They connect the existing and planned elements of the regional trail network to neighborhoods through projects like the Baldwin's Run Tributary Trail in Camden and the Lawrence-Hopewell Trail in Lawrence. Finally, these grants support several landmark projects, including the Manayunk Bridge Trail that will provide a cross-river connection between Philadelphia and Lower Merion Township and serve as a destination for bikers and walkers from across the region. In mid-December, DVRPC received applications for Phase II of the program, for projects that were seeking planning and feasibility funding. Those awards are expected to be announced in early 2012. I don't mean to sound cynical but why the massive bias of money being spent of projects on your side of the Delaware? There must be a reason why only $375,000 of $5.2 million is being spent in New Jersey. Is it that since this money is coming from the William Penn Foundation that a vast majority had to be spent in Pennsylvania? Or were New Jersey towns and counties again "asleep at the wheel" when requests for grant applications were announced? It's a question begging for an answer, preferably posted here. As we have mentioned in the past New Jersey communities are failing to come forward and apply for money to build trails in the past few years. Kudos to Camden County/Coopers Ferry Partnership and Mercer County/Friends of the Lawrence Hopewell Trail for taking the opportunity to expand their trail networks.